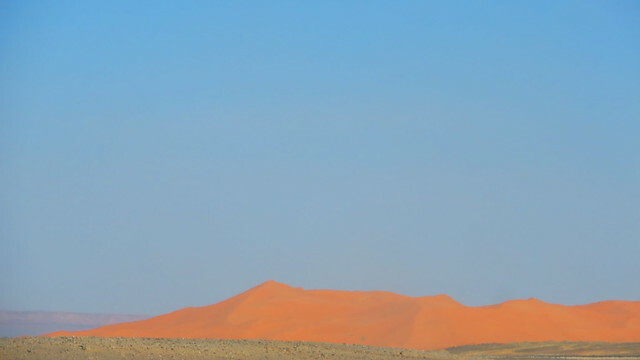 The Sahara is the warmest, and third largest desert after Antarctica and the Arctic. At over 9,400,000 square kilometers, it covers most of North Africa, making it almost as large as China or the United States. The Sahara stretches from the Red Sea, including parts of the Mediterranean coasts to the Atlantic Ocean. The desert landforms of the Sahara are shaped by wind or by extremely rare rainfall and include sand dunes and dune fields. Some of the sand dunes can reach 180 meters in height. The Sahara is a harsh environment with extreme conditions. It is the world’s largest subtropical hot desert, and the world’s hottest desert. The Sahara has mainly a subtropical, hot desert climate especially in the north of the desert where the summers are long and extremely hot, and even scorching in the most part while the winters stays brief, extremely warm to moderately hot. The Sahara is one of the driest deserts in the world and receives a very to an extremely low annual average precipitation. The precipitation in the desert are also very irregular : it may not rain for some years and it may rain more than the annual amount in only one day.The temperature can be very high, especially during summer, with average high temperature reaching 45 – 46 degrees. In Morocco, the Sahara occupies only a small surface of the country, but it’s still a must do when coming here. There are many tour operators who offer desert tours at very reasonable prices, so under no circumstances should this be missed. We opted for a 2 days tour, including camel trekking and sleeping for one night in the desert at a nomad family. Our guide took us to Merzouga and from there we took the camels and had a nice one hour ride until we got to our camp for the night. It was the first time I rode a camel and at first it was a bit uncomfortable, but I got used to it fast. The camels are quite friendly and calm, so no danger here. They walk and walk for as long as they are required to, but sometimes they can get stubborn and don’t listen to the camel driver. As I mentioned before, the weather in May was just perfect for this trip, as the temperature was reaching a maximum of 33 – 35 degrees during the day. When we left for the desert in the afternoon it was still quite hot, but it was a bearable temperature. We got to our camp around 7 PM and we had enough time to climb the sand dunes and explore the area. It’s quite strange for someone who has seen sand only on a beach next to the sea, to see now that everywhere you look you are surrounded by sand. Sand that is constantly moving and changing shape faster than your eyes can follow. Sleeping in the tent was a very relaxing experience. The wind whispering made me sleep like a baby. It’s like it was telling me a bed time story and I instantly fell asleep. I did have so many dreams, like I was under the desert’s spell. In the morning we woke up quite early to catch the sunrise. The good part about watching the sunrise in the desert is that you can watch it more than once in a morning, as it rises over more than one sand dune, so you just have to search for the perfect spot. After the sunrise, we took our camels and got back to real life. I felt as if I was in the desert for longer than one night and it was a bit weird to get used to everything again. It was a nice experience overall, especially staying with this nomad family who had two little boys always looking for some playing companions. Also, the guy who took us there by camel, Mubarak…well he seemed like a very wise guy for his age, only being 27, not knowing to read and write, but speaking English, French, Spanish and Chinese. He seemed to see life in a more simple way than we, people living in modern worlds see it. He had more moral values, leaving aside power and wealth. Values that we, living in the modern societies, sometimes forget or set aside.